The Venice Wildcat Midget Brass team celebrates the end of another exciting season. Originally printed in The Rafu Shimpo on March 21, 2012. Scholarship winners, from left, Emily Wong, Nicole Hamasaki and Kayla Ichiba, with Ken Kitani. 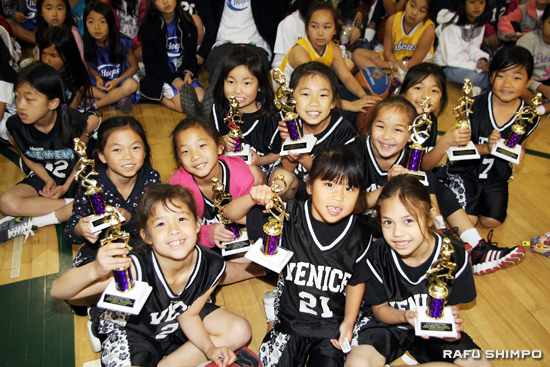 The Japanese American Optimist Club held its 2012 Basketball Jamboree on Sunday at Schurr High School in Montebello. The year-end event saw teams and players recognized for their hard work and spirited play, along with the announcement of annual scholarship winners. 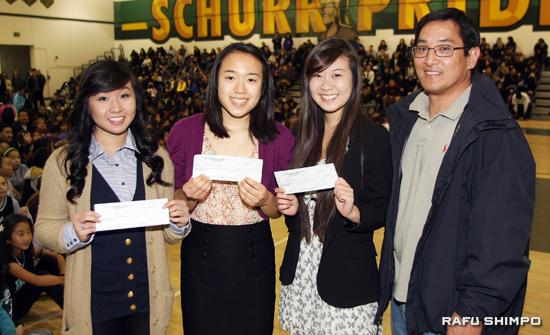 The first-place winner of the JAO Scholarship for 2012 is Nicole Hamasaki, a senior at North Torrance High School. She has played 13 years of JAO ball with the Hollywood Dodgers and hopes to attend an Ivy League school this fall. The second award went to Emily Wong, who is in her last year at Alhambra High. The six-year player with the Tigers is planning to attend UCLA in the fall. Receiving the third-place scholarship was Kayla Ichiba, who played with Hollywood Dodgers from kindergarten through 12th grade. The Schurr High senior is planning to major in communication and broadcast journalism in college.